Direct, static links (aka “permalinks”) should be included on the LMS course page and/or syllabus for all specific library resources, including but not limited to books, articles, and databases. Use the instructions below to obtain the permalink for library resources and contact the library if you need further assistance. Note: The link you see in the address bar when viewing an article in your internet browser is NOT a permalink. It will expire at the end of your browser session. In order to work from both on and off campus, links to library databases must be correctly formatted. To obtain a permalink to a database, visit the databases page and right-click on the link you want. From the pop-up menu, choose the option to “Copy link address” or “Copy link locaton.” Note that this will not work in the Microsoft Edge browser. From the search results page, click on the “Link” option located on the right. From the search results page, click on the title of the resource you want to link to. Then click “Permalink” on the right side of the page under Tools. 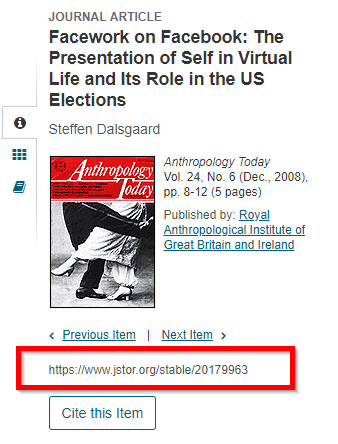 A “share link” is available on the book information page. From the search results page, click on the title of the resource you want to link to. Use the link listed below the article information. Look for /stable/ in the link. From the search results page, click on the resource you want to link to. Click on the clipboard icon near the top right corner of the page and follow the directions that pop up.